Provider Resilience Application that gives healthcare providers tools to guard against burnout and compassion fatigue as they help them. Available for all devices and free. Breathe2Relax Application that is a portable stress management tool which provides detailed information on the effects of stress on the body and instructions. Available for all devices and free. - Grab our FREE Practitioner Tool Kit to get a list and review of all the platforms Kendra and Christine use personally in their businesses to save time, money and generate consistent income. Board Certified Clinical Psychologist and Executive Coach, Kristina Hallett combines science and soul for practical, fast results. She uses her decades of psychological experience and down-to-earth approach to facilitate progress and change. Her mission is to bring the latest scientific research to practical application, helping people feel more empowered and productive. Kristina is also an associate professor, speaker, author, and co-host of the Be Awesome Podcast, featured on Mental Health News Radio. She has been featured widely in the media, including U.S. News and World Report, NBC News, Reader’s Digest, Huffington Post, Medium, Bustle, and many other outlets. Christine: Alright everyone, hello and welcome to this episode of the 360HealthBiz podcast, and today you will have me on my own without Kendra, who is actually lounging in a hammock in Costa Rica at the moment. Bless her, not jealous at all, but I do have wonderful company. 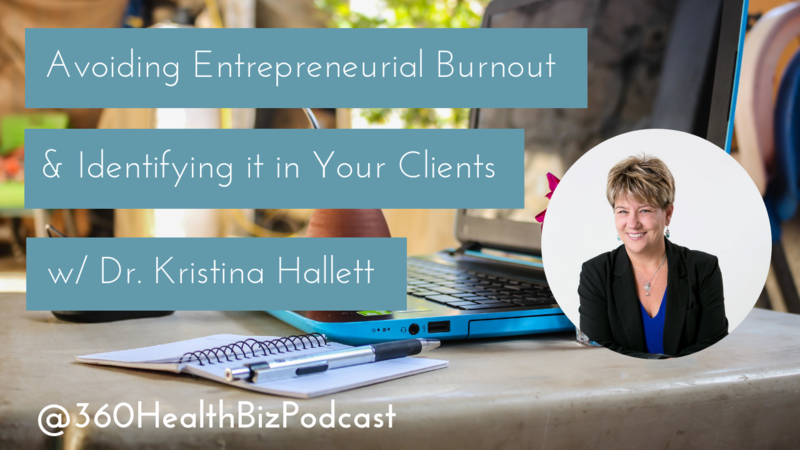 I have Dr. Kristina Hallett with me and we are going to talk all things burnout. So today is going to be a continuous education episode for you guys. And so let me introduce Kristina very quickly to you. So she's a board certified clinical psychologist and executive coach, a combination which I adore. She combined signs and so on for practical fast results. Killer combo, the only thing that works in my opinion, she uses decades of psychological experience and down to earth approach to facilitate progress and change. Her mission is to bring the latest scientific research to practical application, helping people feel more empowered and productive. Kristina is also an associate professor, speaker, author, and co-host of Be Awesome podcast featured on Mental Health News Radio. She has also been featured widely in the media, including US news and World Report, NBC News, Readers Digest, Huffington Post, Medium Bustle, and many other outlets. So we are here with a pro. I am super excited. Kristina, welcome so much to our episode here. Christine: Most of us, we love talking about poop as well, right? Kristina: Exactly. Yes, exactly. So this is one of my sort of like, you know, Hashtag banished burnout, right? Kristina: As long as knowledge is power and the more we know and that's so true in all of the work you do. You know, I, I have looked through, we've talked about your work and it's so impressive how you really look to bring in every element of a person's functioning. So I'm thrilled to talk with you. Christine: Yep, absolutely. And that's what we're going to do today when we talk about burnout. So it's going to be a fantastic episode. I'm really looking forward to this. Now, before we start though, for everyone who's listening, as always, we're going to start with a tech tip and Kristina is actually going to share her favorite app today, and as always, don't forget to surf over to iTunes. Leave us a five-star review if you're like this, if you like our guests, just give us some love and you can also support the show and become a patron of the show. It's all on our website, 360healthbizpodcast.com. So Kristina, Kendra and I, we love geeking out on tech, right, like we love digital business and you have an app that you wanted to talk to us about today. And for those of you who are listening on the podcast, if you actually surf over to the blog, we are recording this and video form and you can actually see her demonstrating this, so just a quick note on the side. But without further ado, let us know what is your secret kind of weapon that you have in your arsenal. Kristina: Oh, and there's so many of them, so it was a little hard to just pick one. But today I'm going to tell you about an app, and it's free and it's available on Android, IOS, like you name it, you can get it, it's free. And it was ultimately developed in the US as part of the, Department of Defense. It was developed for the military. There's a whole suite of apps and they're all ones that I use. And there's tons of research that went into it and they are completely appropriate for all civilians as well. So I use these in my executive coaching across the board. I also tell my students about them because I'm teaching in a graduate clinical mental health counseling program. So this is number one what providers need, and it's called Provider Resilience. What could be better? So I'm going to tell you what's on it so that listeners can hear, but I really do encourage you to go to the video because some of this you just want to see. Open up the app right at the top is a, it's like a half rainbow, and it's your overall resilience rating. And so for those of you who are watching, there it is. That's the resilience. Okay? Now I have these set up purposely, I have a separate one, so I have two of them. This one I use for demonstration purposes, you'll see why. So that half rainbow goes from low where it's red, because we usually associate red with warning signs, all the way up to green, which is good. Love that. Love green. Kristina: And so, all of these different components that I'll describe are a part of this app and they make up your overall resilience rating. So right underneath that you can put in, this cracks me up, time since your last vacation. Kristina: That's one of the keys for burnout, right? So in my demo, this is not the truth. This is not the truth, but I'm going to tell you that according to the app, since my last vacation, it's been two years, one month, 10 days, 23 hours and five minutes. Kristina: That would be so bad, right? So not only is that a ridiculous amount of time, but I love the specificity. Kristina: It literally counts down to minutes since your vacation. So you can just add in when you're most recent vacation has been and then keep track of it because as providers, that's one of the things that we often forget to do. Kristina: We're so busy taking care of other people and hello, we need to walk our talk and do this. Kristina: So there's a vacation clock, there's also a section called burnout and there's a whole burnout scale that you can do, and one of the tools in this. This is why there's so much to this one app. That's why I'm like, it's just phenomenal. I talk about this in presentations I give across the US and internationally and literally people are pulling out their phones and downloading it because it's, there's so much in it. So there's something called the pro-qual, and that's the professional quality of life scale. And it's really nice to have this as a measure. It's a nice measure. It's a self-report. It's about 26 questions, and as you fill it out and then scores it for you and you get three scores, you get a compassion satisfaction score, a burnout score, and a secondary traumatic stress score. Kristina: That gives you your overall pro-qual or your professional quality of life. So we know that as soon as you have, and I'm sort of getting into what we're talking about here, but it's all about the app, so tech and talk at the same time. Kristina: We have to have some marker, and then we continue to do this and we compare the marker so we can see, are we making progress? Are we doing better? Which one of those particular skills is moving in which direction? Right. And it's all right here. So see down here is the pro-qual. That's, that's the pro-qual. Again, these are demonstrations but each one of them gives you a little rainbow. And it tells you, in this case, apparently, oh this is so bad. It's been 838 days since my last update of the pro-qual. So it keeps you accountable as well. Kristina: I know, but again this is for demonstration, so I'm aloud. Kristina: Now it has another section called Resilience Builders and Resilience Killers. And so it's got examples. And so examples of resilience builders are, did you take a short walk? Kristina: Did you perform at debts? Stretching or isometrics? Things like that, and you can put in your own something that you've identified as a resilience builder. And then when you go to resilience killers, that you're going to love this. Did you skip lunch? Kristina: You also get a graph of your pro-qual results and a graph of your burnout results. Kristina: And then, my, one of my, I would say this is my favorite, but they're all my favorite. There's a section on physical exercise and what it is, it's the directions on how to do various chair yoga poses. Christine: [inaudible] I love that. Kristina: Yes. And as you just simply scroll through, it gives you different exercises and I particularly love this. Overall, my approach for all of us as professionals is that we need things that we can do in about two or less. Kristina: Yeah. So know everything that I'm talking about are things that are free. They're accessible, and they're very brief. Kristina: Right. And oops, lost the headphones I want to listen to. So, so this one is super great. And the one caution, that it's not a caution, the one reminder that I give to people, is if you're going to do one of these exercises, make sure you do both sides because you don't want to just turn to one side and forget to turn to the other side. So do both sides. And then the final area in this particular app is something that's called value cards. They're alphabetical, so at the moment what shows up is idealism. Kristina: at taking care of ourselves. And I'll use this as a teeny segway because do you know that in the most recent studies in the US on physicians and Burnout, over 70 percent of physicians who are surveyed show at least one of the characteristics of burnout. Christine: Oh my gosh, let's get going on this because my ears are like, what? So I mean, burnout is like this term that's being thrown around all the time. You know? Yeah. Some people who use it very negatively because unfortunately, you know, it's, a lot of people don't really know what it is. They don't know what it manifests likes, there's abuse that is being, you know, I don't know, in Luxemburg in particular, there's lots of people who abuse it and they just get three weeks or three months of work because they claimed to have burnout. So I think it is first of all important to understand what it is and how it manifests, especially either to become aware that you as a practitioner might actually be going down a slippery road or, what I also find uber important, is when we're working with a client and I mean not everyone is qualified to work in that particular area. A lot of us are coaches and I find that it's our duty to know when we've reached our limits, and I find knowing that someone is on their way to a real burnout that's out of our boathouse for most of us. So for me, this is really on the one hand looking at ourselves. You just said how many practitioners are actually well on their way of suffering severe burnout. How to diagnosis or how to get good idea of what this might be going on with my client or when it's time to refer out. So I would love to talk about these areas. I know it is super vast topic, but I know you are the go to person to talk about this, so I cannot wait to soak up your knowledge on this. Kristina: Oh, thank you. And that's literally one of the things that in my executive coaching I really specialize in because I have the psychological knowledge. So I'm a person who literally others refer to when they get to this place, when things have become too much. Christine: 'What is going on?'Yeah. Lost the plot. Christine: Wrong thing to say. Kristina: Well actually, luckily because this is my area, right? And we've got to, you know, heal thyself. So I look at him like, 'you're right. 'And I thought instantly what is going on? Like this was an over the top reaction. Christine: But it just triggered. Yeah. Kristina: Total trigger total over the top irritability and reaction. And luckily we work, he and I well enough together and he knows me and if he says, if he's going to call me on the carpet and hold me accountable without sounding defensive, there's something for me to look at. It was very clear to me, as I looked at it, that I had gotten to a place, because I was loving what I was doing and busy. So it wasn't that things were bad. Kristina: But I wasn't following the steps that I teach people regarding radical self care. Kristina: And that those little irritants had grown and grown and grown and I hadn't stopped and taken the time to shift the pathway. Kristina: Whether it was the mess or internally, and so therefore match, tinder, boom. Off I went now it wasn't a bad episode of burden. It was like one of the early stages of that. But that kind of irritability, that's something that is an absolute emotional sign that burnout is going on. Kristina: Exactly, exactly. So let me just go over some of the different categories of symptoms that we might see. Kristina: you need to pay attention to that. So similarly, lots of headaches, stomach aches, aching joints, fatigue, insomnia, change in appetite, and again, I know that you'll appreciate this. We might also see an increased drive for junk food, sugar, particularly sugar at nights. Yeah. So physically that's what we'll see. Emotionally, anxiety, depression, irritability, anger, pessimism, cynicism and detachment. Kristina: That's again, that's sort of another, to me these are all yellow flags. Kristina: Right. So you want to think like how many yellow flags do I have? Kristina: Similarly, at work, it could be a drop in productivity or forgetfulness, difficulties with concentration and attention. So all of those can be signs that burnout may be going on and we want to pay attention to that because if in fact we're seeing a whole bunch of, oops I just, something went wrong. If we're seeing a whole bunch of those different signs, then accumulative number of those or seeing that over a number of days. So absolutely as you said, anyone can have a bad day, anyone can have a bad couple of days, but when you're beginning to feel this way more as more often than not, or as a regular course, you really want to begin saying, 'hm, let me do an assessment. 'That's why I love the Provider Resilience app. Kristina: Because you can log this and you can sort of say, 'hm, how are things going? 'Now one of the other things that we know, is that everybody has this recency bias. So anytime someone comes into my office and I say, how are you doing? Literally they start telling me about the last 48 hours. Christine: I get it. Yeah, it's like when my clients come, I've been sleeping well for two months, but the last night I had a bad night and it's like, 'oh, come on. 'You've been sleeping so badly before every night, so yes, Yeah. Kristina: So we want to pay attention to that for ourselves and in our clients. Right? We want to keep in mind that people are immediately looking at really the short term past what's gone on. And so that's why I love tracking, so using particularly tech tools to track how are you doing or how is your client doing, having your client track, doesn't matter and you know what? Your client doesn't have to be a healthcare provider, anyone can get this app. So even though I'm saying 'Provider Resilience' and it was made for healthcare professionals, it works for everybody. That's what's fabulous. Kristina: But particularly relevant to the healthcare professional. Kristina: So we begin to track this. We're like, 'okay, I'm having more and more of these signs. What's going on? What do I need to pay attention to? 'And then we need to step back and begin to take sort of an inventory of what am I seeing and how strongly is this feeling? You know? And so remember I mentioned pessimism and cynicism. Christine: I have the [inaudible] my cynicism sometimes. Kristina: So and so do I mean I am, I consider myself a realist, although my friends will often also say that I'm Pollyanna, not so I don't ignore the truth. I totally believe in bringing in a realistic view, but I want it to be balanced. So I think our goal is balanced. We don't want to be up all the time. We don't want to be down all the time, right? We want that seesaw to be relatively balanced. So the prime key for me is when you look and you say, am I in balance? Like in general, if I think of the last week or the last month and having data helps, then am I in balance? Or are there more days where I'm catching myself being this other way? So I'll give you an example from one of my executive coaching clients, senior executive. And the reason she came to me as she, she said, 'hey, I think I'm having some real anxiety, maybe going into depression and so maybe I need therapy.' And I said, you know, can we talk coaching first before therapy because like, let's see where you're at, let's assess this. So instead we did coaching and what it was was burnout, and here was her sign, her number, two major signs, one was she noticed that at work, little things were irritating her. Christine: Yes, I have so many clients with that. Kristina: She was finding herself being a little shorter or a little more snappy to her staff, and she was really beginning to think, 'okay, how quickly can I retire? 'Now this was a young woman. She was not at traditional retirement age, you know, sort of early, middle age. And so literally as she loved what she did, she didn't want to stop it. But she understood that she was feeling irritable. Christine: Something was happening. Yeah. Kristina: Yes. And I think one of the things that we do is when we begin to question this, we might go into this other area of, am, do I have an anxiety disorder? Is this depression, anxiety and depression go hand in hand, and we may be feeling more anxious, so she was also waking up and immediately overwhelmed by thoughts of her workday and what was she going to do, and how could she manage it and would get anxious. So she was experiencing anxiety. She was experiencing some of the early signs of maybe like an irritable agitated depression, but she didn't have a full blown anxiety disorder or she wasn't in a major depression. And that's part of that differentiation I think is important because early intervention can make such a difference and so I don't want us to pathologize things and that's what we do. We tend to say, oh look, right, because we're often so critical, so I was fine, fine, fine, fine, fine. And now everything's, everything's blown up and it's awful. And that's where that pessimism and the cynicism can come in, and we are sort of overly negatively catastrophizing how we're, how we're doing. Kristina: So the other sign for her was that she would come home and she was too tired to do the things that she said she knew she should. So she wasn't exercising, she had a hard time at making a healthy meal and she'd sit on the couch and eat cookies and basically give herself a hard time mentally about sitting on the couch eating cookies and not exercising. And so literally she was like, I know what to do. Like, you know, I'm not an idiot. I know exactly what to do, but I can't get myself to do it. Kristina: And so what I said to her, as you know, let's think about this differently. What if we think about this as burnout and what if we say it's at a stage of burnout that absolutely, in a very short period of time, there are some things that you can do, hashtag radical self-care, in order to stop the progression and turn things back so that you're back to loving the work that you love, feeling, that you have energy doing what you need to do to take care of yourself. Kristina: So one of our very first interventions was starting the day off with laughter. Laughter is the best, biggest hit of dopamine that we can get. Kristina: Dopamine makes us feel good, right. So she loves, this sounds so silly. She loves funny YouTube cat videos. Christine: Oh gosh, who doesn't. Kristina: Dancing parrot. I liked the dancing parrot, right? They crack me up. Kristina: So now traditionally we would say, don't look at your phone right away. Don't go on media. Okay, that's all well, generally speaking, that's true. As in don't dive into it. Christine: Don't check your email. Don't go on the internet. Yeah. Kristina: Exactly. But for her, the minute she woke up, she was flooded with these anxious thoughts about what she had to do and how she didn't want to do it. So we needed to get that to stop right away. Christine: Not spiral out of control. Yeah. Kristina: and then get out of bed with the energy and the positive mood to face the day. Kristina: Shower, eat, etc. and later go look at the email. So that's just one example. That's radical self-care. Kristina: Right? And that's what I mean. Simple intervention, simple short, no cost or low cost interventions. Kristina: and then we need a break. Christine: It's much less than we actually think it is. Like an eight-hour workday it's just ridiculous. You never going to get eight hours of work done, it's just ridiculous. Power naps baby. Yeah. Kristina: Yes. So we actually need, the research says, and it depends on what it is that you're doing, but somewhere between 50 and 75 minutes, we must take a break. Meaning you can't work longer with focus concentration than either an hour or an hour and a half, sort of depending on what you're doing or what your profession is. And so at about 50 minutes you need to take a brief break. What do we do? We pull up our Provider Resilience app and we use some of those things to rejuvenate us during that. Kristina: So again, right? We're talking five minutes or less, and that context switching in that moment, basically reboots your brain so you can go back in with increased focus and concentration. So that's one of the ways we use some time blocking. Kristina: but that would, right? Again protecting her and saying no, so she could say yes to her to have more, to give. Christine: Love it. So this is obviously super important when we have a client or when you know for ourselves, you know, if there's someone listening and it's like, okay, I see I literally coach five clients a day for one and a half hours. It's like, come on, you know, how's your brain supposed to do that So I think for ourselves, this is a super important one. Now my next question would be, I know that if you know, you have a case where this person wasn't as mindful or wasn't as open to, you know, get help straight away. I mean, this lady, she was aware, she knew that something was going on and most of the time our clients usually feel that something's not right. What do we do when we have someone? Because if you have a full blown burnout, it's seriously physical incapacitating and it can leave permanent damage. So, what would you suggest? What are some of the signs where you would say, okay, this is actually not just a yellow flag, there's this like orange verging on red. When is it time for a general health care provider or health coach to say, this is not my boathouse anymore. I need to refer this out in order to give my client the best care possible. Kristina: The things that I see most commonly at that more advanced stage of burnout are an unremitting fatigue, a sense of hopelessness and this negativity or pessimism about the ability to change. Christine: Interesting. That is a thought I cannot change anyway. Kristina: Right? There's nothing. It literally comes down to I'm helpless and hopeless. There's nothing I can do. I have to do ABCDE. There's no getting around it, nothing can change. And our thinking, the more burnt out we are. We just talked about a lack of mental flexibility. Christine: Okay. So complete inflexibility and, and like not seeing the forest for the trees. Kristina: Right. And this degree of, it's not even, it's even beyond flexibility. It's often this, huge resistance, and that won't help. Kristina: Even if I did that, that won't help. Christine: See, I wouldn't have known that. So this is super interesting to me, okay. Kristina: Yeah, so again, we're often using the relationship we have with the person to say, how about, how about you? I'll say like, let's test the hypothesis. Let's do an experiment, right? People love that. People like, all right, right, fine, because we're not gonna. I'm not gonna say, I mean I think I'm right, but hey, what do I know? I'm not you. You know this. So are you willing to engage in a little experiment to see what happens. Now one of the core techniques that we're using to manage burnout aren't really because burnout is about stress and stress management, right? Whatever the stressors are, it's all of that. Stress doesn't have to be bad, but that's a whole other conversation. The power of stress. But when we're talking about in this way, one of the impacts, again, of stress, is that decrease in cognitive flexibility. And stress means that our limbic system and our Amygdala is highly activated. So basically we're on red alert all the time. Kristina: That's why we get the irritability. We have a greater startle response. Christine: Yes. Just on edge. Kristina: At all. It's almost done. Right, I'm on edge. I can't catch my breath even though you're not out of breath. Kristina: That feeling like the world is coming down on me. Christine: Your lungs are just too small suddenly. Yeah. Christine: I know. They want something new. Kristina: Let me tell you. Yeah. And I'm going to say my techniques fall under another catchphrase. 'Simple, not easy. 'They're very simple, but it's not easy because you have to make a commitment and you have to persevere in applying the technique. So it's simple but not easy. Kristina: And so really validating that like, this isn't going to be easy, but if you don't want to feel as crappy as you feel, I can change that. Kristina: And we start that with breathing. So I'm going to throw in here another little app for you because this is one of my favorites. There's about a bazillion different good breathing apps and I will say to people, 'hey, find one search, find something that you love that works for you,'but the same group that developed Provider Resilience, did this app that I'm going to tell you about, and it's called Breathe2Relax. So it's the word Breathe with the e, 2 the number 2, Relax, also free, totally available. Kristina: And the reason I love this is it has an audio component, so there's a voice that tells you what to do. You can set the background, so you have a pretty background and you can adjust the length of the inhale and exhale so you can customize it. But the part I love the best is it has a little cylinder that fills up as you inhale and then the cylinder. Christine: So you visualize it. Kristina: Exactly, exactly. If someone has an apple watch as an example, there's a that there's a little circle and it gets bigger when you breathe in. Christine: I love it, yeah. Kristina: Fabulous. So again, we're talking like you can do this two minutes, two minutes or less when you go for a potty break. So, it also gives you a rate your stress, so you can rate your stress from low to high so you can track it as well is, it's always about tracking. But if I go to this, come on. Alright, I'll just start this and I'll show you a little teeny bit of it just so you can see the cylinder. And again, for those of you who are listening, check out the video so that you can see this because it's pretty awesome. All right, so oops. Christine: Oh yeah, I can see it. Alright and so now and again, yeah, I love that. So you have this cylinder filling up and basically emptying out again, I love it. Kristina: Yes. And I picked flower background because it's nice and it's a soothing voice, whatever, but you can set it to whatever you want. So what we know is that all of our sensory memories, good and bad, are stored in the limbic system. That's what the amygdala does. And that's our warning system as well. So when we use additional sensory components, we can help calm the amygdala down even more. So this app in particular, we've got the audio sensory who have the visual sensory, right? Both of those are there as it's guiding us to do the breathing, which is the important piece that we're really trying to do. So it's the breath that makes such a difference. The amygdala in that with the other sensory components. Christine: Exactly. And that's what I love to tell people is that you are in control. Like your brain, yes, it is incredibly complex, but it's also incredibly basic, and you can control it. It's the best thing in the world, especially if I have people who are like, 'everything's out of control. It's spinning out of control. I'm just a slave to my thoughts. 'And it's like, no, you're not. You can use your physiology to literally control your thoughts. Christine: Which I think is super powerful and empowering really people in so many different ways. I do these things with my clients before going to bed, but this is definitely something super easy. But yes, not or simple, not easy. Which I think is a great tool to let people know, and I love also that you told us what to look out for. So we're running out of time, but I think we know after this episode, we know what to look out for, what you watch out for, for ourselves. Like I definitely have a couple of yellow flags at the moment and super stressful at the moment. Right now. My business is going great. So lots of stuff going on. So I need to walk the talk as you said, but also for my clients, like, I looking back, I definitely had at least five to 10 clients where I would say they were definitely showing some signs. Inadvertently I do a lot of techniques that help burnout as well. But I loved that you said that one of the main things that you have to kind of think about referring out is that when people become stuck, you know. Christine: And really give up on themselves and just think this is never going to change. And if you don't have the right way of talking to them, I believe that you hit a wall and you're not serving them. So for everyone out there, if you do have a client like that, please, maybe they can even get in touch with you and ask you for advice. How would they do that? Christine: I'm just like, oh, not quite there with my practice, which, you know, I do stuff paper to a certain limit but I'm not a clinical psychologist or psychiatrist or whatever, you know. So I know when I reached my limits I would just say, look Kristina, I want to refer you someone, let's just do this together. And if they fine with it actually may be exchanged notes, depends on the kind of course. Yeah. Kristina: Exactly. And then I would work on that piece and then send them back to do the piece that they were doing, because I'm not trying to be an expert in everything either. Kristina: So one of the people that I work with in fact is teaching people about money management and being in charge of their financial side of their business. But same thing if a person you see this with entrepreneurs all the time, if they get burnt out, they're stuck. Kristina: but also making a difference. Christine: Absolutely. And I think it's a sign of being an integrity and it's also a sign of being a high end coach if you have a referral network, if you have a team that you know can help you with, just showing that you have a great network and it's just professional. I just find people knowing when to say stop and having someone they trust that great to work with, that's just showing how professional you are. So anyone who's doing coaching but it has a lot of these types of people and it's like I don't feel quite equipped for that. I think Kristina would get better results. She obviously has the experience. She has the credentials. We just heard her speak, so everything's just been golden. Then do you get in touch with her. We have all the links on our website, 360healthbizpodcast.com. You'll just have to click on the links and you can get in touch with her and I just think this is amazing. Have a look at the video where she's demonstrating the app. We're going to link it as well in the post on the transcript and that's all we have time for today. Kristina, I cannot tell you how grateful I am for you being here and sharing all this system with us. I think it's a topic that's, you know, people roll their eyes as soon as they hear the word burnout because it's just been used so much, but it's very, very real and I think because so many people are fed up with it, they don't care to even look further into it. So I think this is a golden episode that every health practitioner is mandatory to listen to it. Kristina: Well, thank you so much for having me on. As I said, this is my passion because I truly believe that we can feel better and when we feel better, we give better care and so that means that we're literally making a difference in changing the world, and we have to start with ourselves. Christine: Yes, we do. I love this. I'm totally in love with you right now. Crushing hard. Kristina: Yes, yes, yes, yes. Ditto, so there with you. Christine: Alright, well everyone, thank you so much for tuning on, surf over to iTunes if you've enjoyed this episode and give us some love there, and all the links on our show notes on our website and we're looking forward to talk soon, next time together with Kendra and stay tuned for more business tips and also continuous education tips, which we did today. So thank you so much for being with us and that's it for today. So bye.